The Holdy introduced its all-new Sailor Jerry Garden Bar and nautical inspired menu last Saturday. 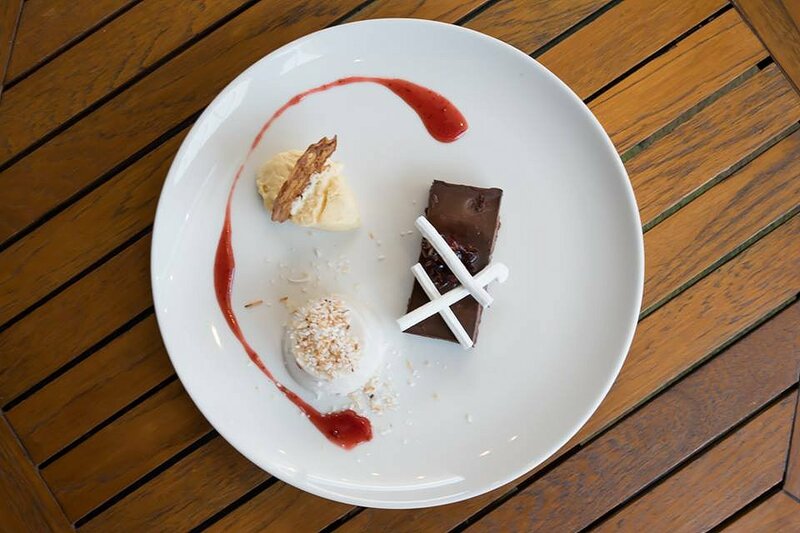 This iconic Glenelg landmark has once again updated its ever-evolving menu to bring a new culinary experience to its visitors. Hotel Owner and Manager, Jeffery Owens says they hope to have created a menu that encourages and assists customers to spend time with one another, even in today’s busy lifestyle. “We’ve created an easy going ambience where you can forget about your phones and simply enjoy a shared meal, a quiet beer or two, and just relax with good company,” Jeffery said. The new nautical themed menu is created to pair up wonderfully with the new Sailor Jerry Spiced Rum Bar, and also matches with seaside theme of the Hotel itself, featuring many delicious seafood dishes. But The Holdy still made sure to include the traditional pub favourites that everyone enjoys, as well as a delicious dessert menu that is sure to please all. Head Chef, Hayley Mass, loves to source local and fresh produce for her dishes to showcase the best of South Australia, and says the new menu consists of the perfect dishes that can be shared and talked over. “I’ve also introduced new flavour combinations with quirky additions like bacon aoli and rutabaga to tantalise the taste buds and get those conversations going over the table. I love to surprise people with unexpected flavours,” Hayley said. At the new menu launch, we were treated to a lovely lunch with live music by All About Her duo, where The Holdy did as they promised and presented us with a lovely ambience to be able to graze on our meals and just enjoy the time with friends. The Tapas Plate with Pesto Arancini, Squid and Spicy Chorizo was a lovely start to the new menu. The Arancini was lovely and warm while the pesto gave a lighter feeling to the savoury treat. The rice was cooked perfectly and gave a lovely texture balance with its nice crisp outer coating. The tomato based sauce topping gave a lovely flavour combination with the pesto and the shaved Parmesan cheese held a slight creamy tang that tied the dish together. The Squid was lovely and fresh and the firm white meat gave off a mild, slightly sweet almost nutty flavour, along with slaty tones and a lovely refreshing and light dressing drizzled over the top. The Chorizo was lovely and smooth but packed a punch with heat that lingered in the mouth. But the beautiful quality meat was quickly snatched up even with its heat, just perfect for those who love some spice to their food. Chilled Prawn Cutlets were served as a prawn cocktail with a lovely house-made alcoholic seafood cocktail sauce. The presentation was beautiful and we couldn’t wait to taste. The fresh prawns were delicious and still chilled on arrival. Served with lovely fresh lettuce, carrot and a bit of onion, the salad paired perfectly and helped balance the bold flavours of the prawn cutlets. The lovely house-made alcoholic sauce was beautiful and creamy in texture and held a slight tang that matched with the fresher flavours of the prawns and salad. Overall this dish was a beautifully fresh and delicious entrée. 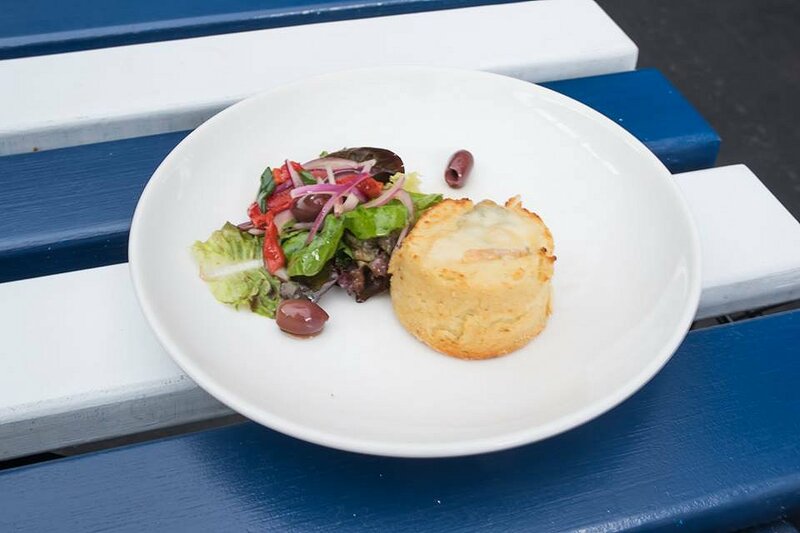 The Blue Cheese Soufflé was our favourite entrées of the day. The soft and fluffy soufflé just melted in your mouth. It was lovely and warm and had a slight crunch to the toasted outer, balancing with the smooth and creamy centre. The blue cheese gave a lovely strong tang that was definitely the hero of the dish. The Soufflé was a wonderfully delicious meal that I would happily eat over and over again. “Nothin But A Chicken Thang” Pizza had a lovely thin base that was cooked well and held a slight crunch on the crust. 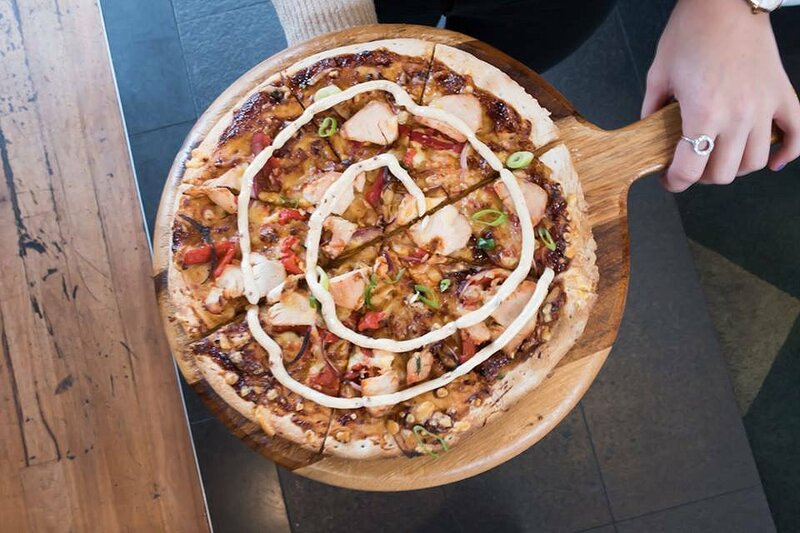 A sweet and slightly tangy BBQ sauce covered the base with lovely chunks of tender chicken pieces and a tasty aoli drizzled on top, which held a slightly spiced tang. The lovely mix of flavours from the BBQ base and the aoli wasn’t overpowering and paired nicely with the other ingredients, while the roasted capsicum and the fresh shallots to top freshened the dish and complimented the savoury base sauce and chicken pieces. 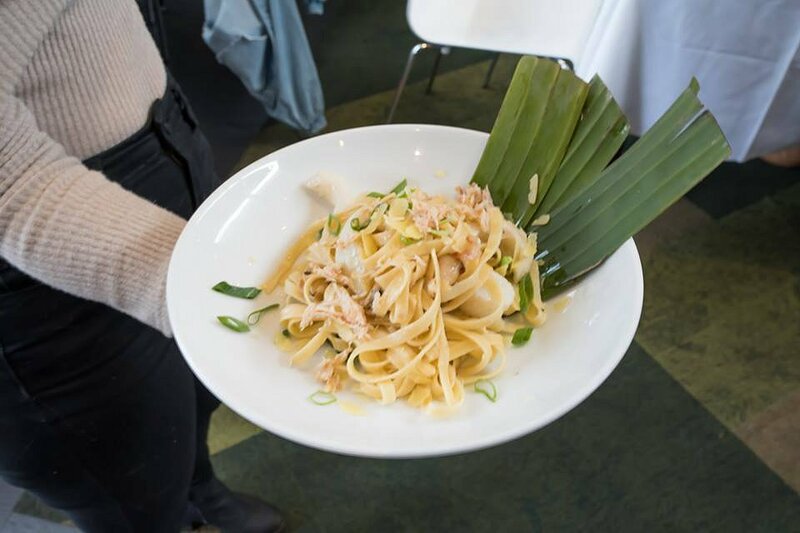 The Fettuccine Marinara was was cooked well and there was a generous amount of seafood throughout the dish. The market fresh seafood served along with the thick pasta was a filling meal but sure did showcase the new nautical theme of the menu. 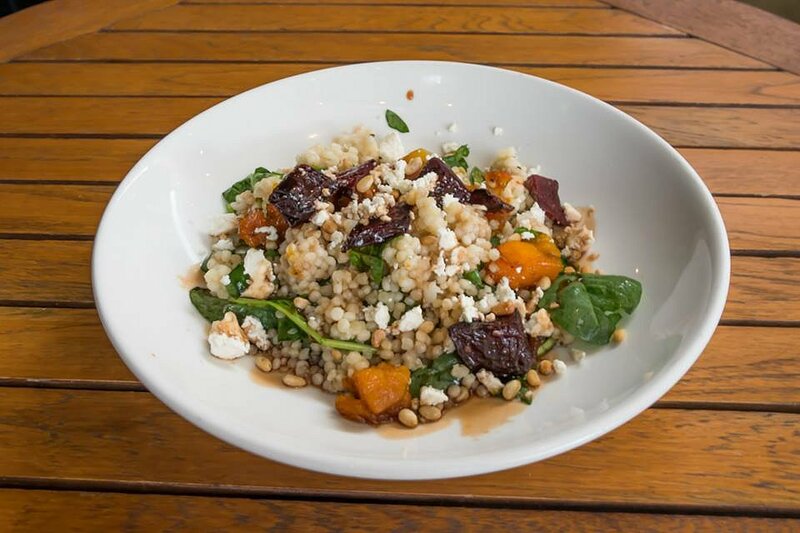 We also had a lovely Feel Good Salad, made with large ptitim couscous, spinach, and soft roasted pumpkin and beetroot, which was all topped with a lovely sweet salad dressing. The entire dish was warm and fresh, with the soft couscous seasoned perfectly and the pumpkin and beetroot pieces wonderfully cooked. The salad had a delicious savoury tang from the topped feta. This dish was a delicious option on the menu that would get you eating healthy but feeling like you are on a cheat day. The Kraken BBQ Chicken was served with roasted potatoes, beans and a lovely thick and sweet BBQ sauce. The chicken was cooked nicely and paired perfectly with the sauce, the sweet and savoury flavours balancing well. The roasted potatoes were perfectly seasoned and had a nice slight crunch on its skin. The beans also had a lovely crunch and added a level of freshness to the very savoury dish. The lovely crispy, smoky bacon bits sprinkled on top were a delicious bonus and helped tie the dish together. 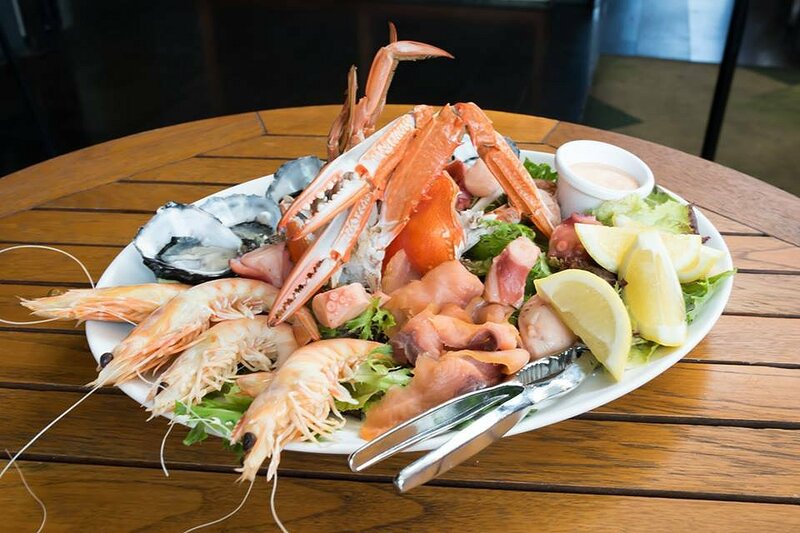 The Holdy’s new Seafood Platter is enormous! It featured local oysters, crab, salmon, octopus tentacles and prawns with fresh lemon on the side. This dish had everything and it was no surprise it became a major hit on the day. The produce was extremely fresh and there was a wonderful variety of seafood flavours, without the overwhelming and unwanted fishy taste. This dish was also served with the lovely house-made alcoholic seafood dressing that was featured earlier in the tasting, which was a wonderful component that added another flavour level to the dish. The Bedrock Pork Ribs was another massive dish. The ribs were cooked well and had a lovely smoky, sticky sauce coating that was amazing. The smoky, savoury flavours balanced well with the fresh, crunchy coleslaw that helped to lighten the dish. We also got served delicious curly fries to add to our meal. A thick sweet BBQ sauce and a hot peppery sriracha were served on the side for dipping your ribs in to and add to the flavour, making your ribs extra saucy, which I love. 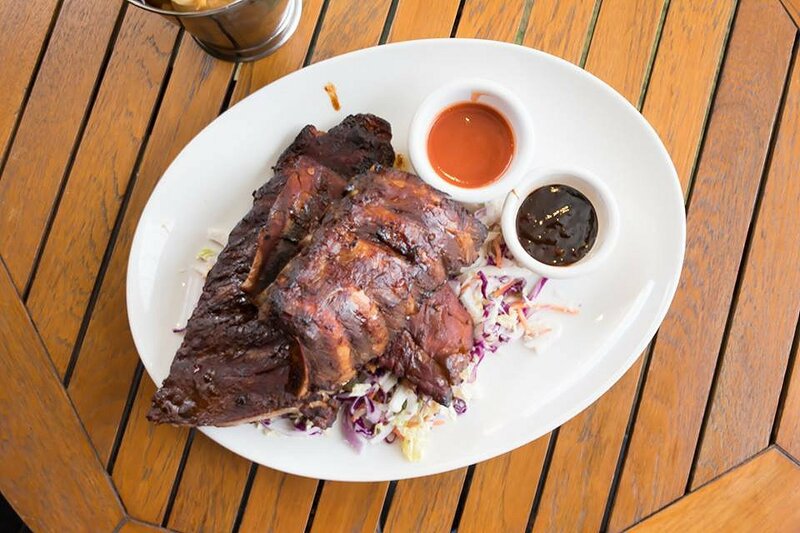 It also was a great option for those who like to make their ribs a bit sweeter or a bit spicier which helped to cater this dish for everyone’s taste buds. This generous serving ended up defeating us in the end and we couldn’t finish it all, but boy did we try. For sweets, we were served a lovely Tasting Plate of Desserts, presented with a Coconut and Lime Panna Cotta, a Chocolate Delice and a Baileys infused White Chocolate Mousse. All three desserts were a treat and definitely satisfied my sweet cravings. The Panna Cotta was vegan but you could not tell. The texture was very smooth and creamy, while the flavour combination of the coconut and lime made it sweet and refreshing. The Delice was served with sweet meringue sticks and candied alcoholic berries on top. The dark chocolate base was thick and rich, while the meringue and berries helped balance out the flavours and add a sweeter tang. The white chocolate mouse was sweet and creamy, with a wafer thin tuile to add a slight nutty flavour and give crunch. All the dishes on The Holdy’s new menu were beautifully presented and it was evident Head Chef, Hayley Mass, wanted guests to have a beautiful experience from start to finish. 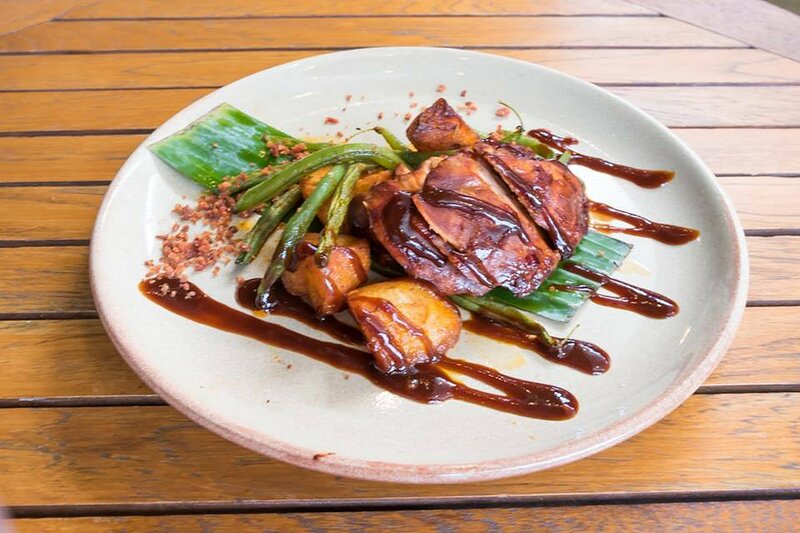 The new menu is sure to test and treat your taste buds, with inclusions of vegan and celiac friendly options to suit everyone’s dietary requirements. And with the all-new garden bar dedicated to the Sailor Jerry spiced rum, you can now enjoy tasty drink along with a delicious meal, in a space that offers up the perfect destination for entertainment for the whole family. 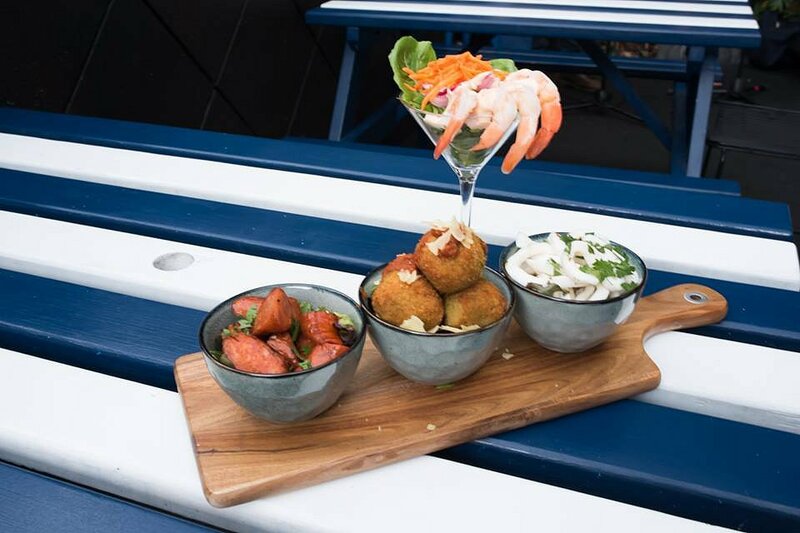 So come and bring your friends to share and enjoy some refreshing beverages paired with your favourite seafood dishes this summer at The Holdy.